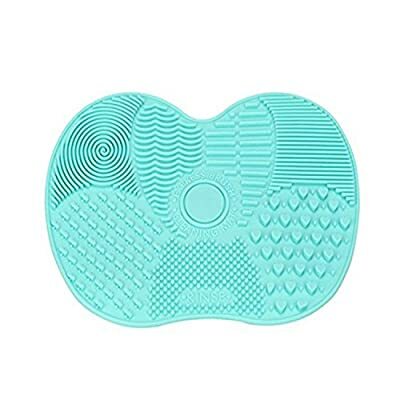 100% brand new Silicone Makeup Brush Cleaning Mat, Makeup Brush Cleaner, Cosmetic Brush Cleaning Mat Portable Washing Tool Scrubber with Suction Cup. Feature: 7 Kinds of screw thread design, suitable for a thorough cleaning all kinds makeup brush. This makeup brushes set covers multiple needs of beauty applications, such as eye shadow, lip shade, concealer, etc. First, pour washing liquid on the part with the word of "wash", wet the brush and clean the brush head in a circular way. "Wash eyes", with dense screw thread, suits to fine and small brush head for eyes, and "wash face", with round and smooth screw thread, suits to big brush head for the face. "Refine" indicates the part able to do careful cleaning, which is located on both sides of the "rinse", allowing more thorough cleaning of the brush.